The DNC's bid to energize African American turnout this fall began with these words from Chairman Tom Perez in Atlanta: "I am sorry." Swanky fund-raisers don't often begin with an apology to the well-heeled donors who shelled out thousands of dollars to sip wine, eat steak, and listen to pep-rally speeches. 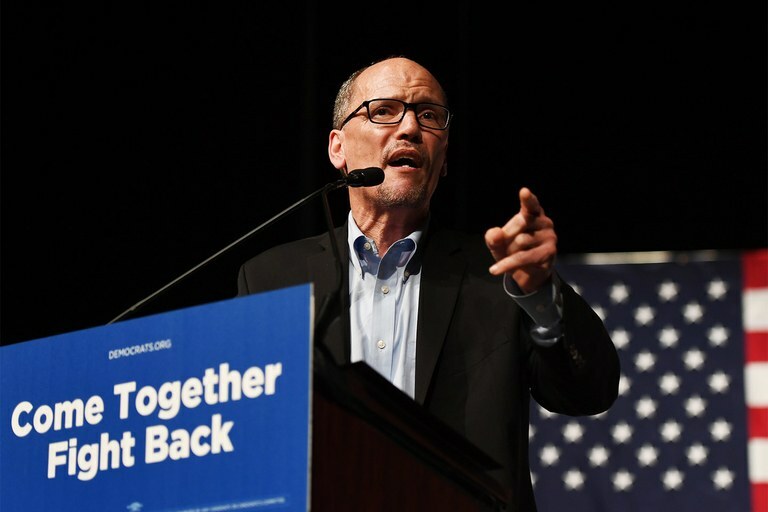 But as he looked out over a predominantly black crowd gathered at the Georgia Aquarium on Thursday night, Tom Perez, the Democratic National Committee chairman, felt compelled to issue a mea culpa. "I am sorry," Perez said. At first, it seemed like Perez was voicing one more generalized regret for the 2016 election that put Donald Trump in the White House—the squandered opportunity that abruptly ended the Democrats' hold on the presidency and immediately put at risk its policy gains of the previous eight years. Perez, however, soon made clear that his apology was much more specific. "We lost elections not only in November 2016, but we lost elections in the run-up because we stopped organizing," he said. "We stopped talking to people. "We took too many people for granted," Perez continued, "and African Americans—our most loyal constituency—we all too frequently took for granted. That is a shame on us, folks, and for that I apologize. And for that I say, it will never happen again!" Applause broke out before Perez could even finish his apology, heads nodding in acknowledgment and appreciation. That he would choose this event, and this city, to try to make amends with black voters was significant. Thursday's gala was the party's first major 2018 fund-raiser to be held outside Washington, D.C., and the I Will Vote initiative it supported aims to bolster DNC efforts to register new voters; fight voter-suppression efforts in the United States; and, ultimately, turn out Democrats across the country in November. High turnout among black voters was key to Barack Obama's two presidential victories, and dips in participation when he was not on the ballot contributed to the Democratic wipeouts in 2010 and 2014, and to Hillary Clinton's narrow losses in states such as Michigan, Wisconsin, and Pennsylvania in 2016. But there are signs of a revival, not only in response to Republican efforts to reverse Obama's legacy, but also in response to efforts to erect barriers to voting that disproportionately affect African Americans. In Virginia, strong black turnout helped elect Governor Ralph Northam and the state's second black lieutenant governor, Justin Fairfax, last November. A month later, black voters—and black women in particular—powered Doug Jones to victory over Roy Moore in Alabama's special Senate election. This year, nowhere will black turnout be more crucial to Democratic hopes than in Georgia, where Stacey Abrams is vying to become the first African American woman elected governor of any state. Her nomination over Stacey Evans, a white woman, in May drew a surge of national attention, and the DNC's decision to hold Thursday's gala alongside an African American leadership summit in Atlanta brought major party donors to Abrams's home base.